D.C.'s No-Drone Zone Gets Help From Superman And E.T. : All Tech Considered Washington, D.C., has long been a no-fly zone, but authorities are taking to social media to remind drone hobbyists to keep away from the Cherry Blossom Festival. 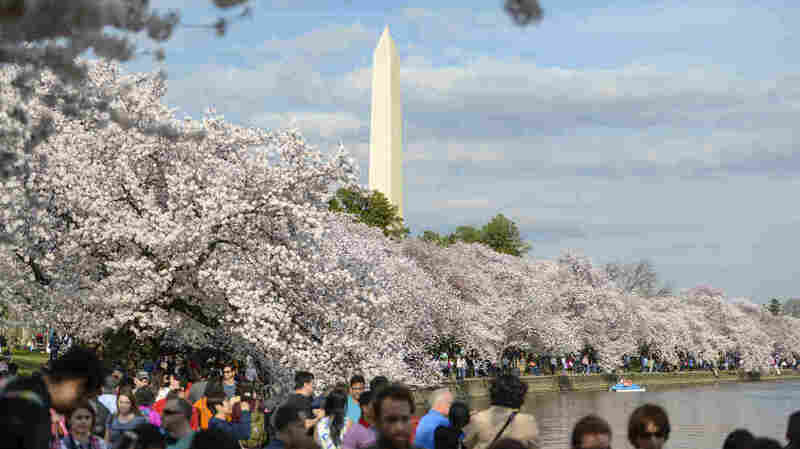 Cherry blossoms are seen in full bloom on the Tidal Basin on Friday in Washington, D.C. Officials are urging visitors to leave their drones at home. Welcome to Washington, D.C., home of one of the most restricted airspaces in the country. This isn't so new, but in the throes of cherry blossom season, the FAA and D.C. police have taken the opportunity to remind would-be aviators of the rules. If you want to get mail delivered by a drone, or shoot video with a drone, or do something weird like fly your drone made out of your dead cat (for *~art~*), you probably shouldn't live in or around the capital. These rules were around long before the proliferation of hobbyist drones; they were first put in place after Sept. 11 to establish a "national defense airspace." Now, the rules are getting beefed up. In September, the Federal Aviation Administration extended the no-fly zone for drones around Ronald Reagan Washington National Airport from 15 miles to 30 miles. At least 36 drone and model aircraft clubs got shut down. Many drone manufacturers are developing geofencing, which restricts flight through the drone's software. The Washington, D.C., Metropolitan Police Department and the FAA want to make absolutely sure you know these rules. They've launched a social media campaign that probably makes the issue seem like a bigger threat than it really is — although then again, more than 400,000 people have registered their drones in the U.S., according to the FAA.